Welcome to another Fortune Cookie Fortune Exposé! 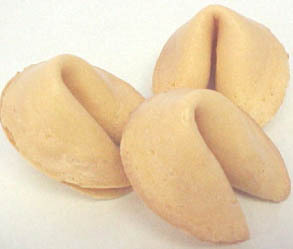 Today there are only two fortunes to look at, but they promise ‘everything’! Ooo, how pleasant. I love it when everything comes my way — I assume it’s like when everything comes up roses — especially with instant gratification! Everything will come your way. See the difference? This won’t happen now. I’m even more suspicious considering we’ve seen “Everything will SOON come your way” in a previous post. Well I’m onto your game, fortune cookie writer. I’m on to you. Welcome back to another weekend fortune cookie adventure! Or perhaps it’s a lack of adventure. Who knows? These fortunes don’t. All of them seem to be rather… ambiguous in nature. More ambiguous than usual, that is. I may make a name for myself? Just leaving it as a possibility, eh? Way to cover your bases, fortune. A cheerful letter or message is on its way to you. This one doesn’t seem too wishy-washy, but take a closer look — it can’t make up it’s mind on whether it’s a letter (which is a rather specific form of communication) or a message. That’s right, one of the most vague ways of saying you’ll communicate with someone. Is it going to be an email? A conversation? Some smoke signals?! An airplane banner?! A telegram?! A burning bush?!?! WHAT WILL IT BE?!?!?! Whoo! A thrilling time ahead (in bed)! But wait… a prospect of a thrilling time? That’s hardly a garauntee that there will be any thrill in the future. That means there’s a prospect of an unthrilling time too. Or maybe you have to prospect to get your thrills. Prospecting - a most thrilling experience. I guess I’ll take a pass, then. That’s all until next time, then! May your future fortunes possibly give you thrills! Ahh, it seems like only yesterday I started to post the fortunes I got out of fortune cookies. Turns out it wasn’t yesterday – it was over a year ago. And it’s been almost exactly a year since I last did a post in this series. Today that ‘no fortunes’ streak ends. For I have been saving fortunes to share with you, Dear Reader. And now I shall slowly dole them out in a series of posts on the weekends only! (Was that a situation for an evil laugh? I’m not too sure. What am I whispering about this for anyway? It’s the weekend; no one’s reading). Anyway — onto the fortunes! Hm… this seems familiar. No matter. I do like to repeatedly hear about how active and keen my mind and imagination are, respectively. I hope that means I have latent psychic powers or something, because that would be awesome. Heeeey, this seems familiar too. Like we’ve just seen it three fortunes ago. Oh! I guess we have. And I’m not just repeating it to be funny — a set of fortune cookies I opened after one meal had two of the same fortune! I guess they didn’t shake up the box enough. That’s all for this week’s fortune cookie edition! 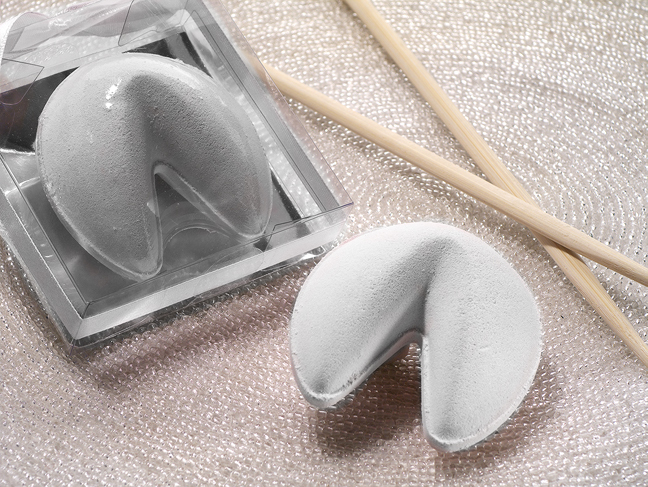 May your fortunes give you good luck in your personal affairs! Not exactly a pleasant combo, eh? I caught some sort of cold, or something, and was pretty out of it for a couple weeks. But thankfully I got some medicine from the doctor and now I’m feeling much, much better. But the illness still interrupted quite a few of my plans. You know, leveling WoW characters, writing Shared Topic blog posts, oh, and that wedding planning thing. I got a bit delayed on that too. And yes, it’s true — I’m getting married (that’s why The SA is not my boyfriend or husband, but fiancè. Crazy, right?). The date is October 10th, 2010 (hahahaha 10/10/10 — how clever of me, even if it is a Sunday), which means that I’m starting to enter my pre-panic phase of wedding planning. You know, the part where you wonder if you should be panicking, and then decide that no, full-blown panic can wait a few weeks or months, just like the rest of your plans. Annnnyway, that means that in the time that I haven’t been sick, I’ve been sitting down with The SA after work to hammer down various details, like music choices and ceremony details, and marking down RSVPs and taking care of all the other stuff I forgot about. Everything will soon come your way. Silk writes of this fortune, “Are fortune cookies always this OMINOUS?” I would hypothesize that not too many would be intentionally ominous, as then people would stop buying fortune cookies. But I bet at least a quarter could be construed at ominous (Tall, dark strangers, anyone? Very ominous). Also, it is extra hilarious when you add “in bed”. Ahem. Enough of that aside! Here is the last fortune cookie fortune for the day! Oh, that’s comforting to hear. Er, read. Either way, I’m sure my active mind and keen imagination can figure out what I’m dumb about. Hopefully. Otherwise I think this fortune cookie just insulted me. Categories Fortune Cookie Fortunes, Real Life? What's That? Now, whenever me and The SA get Chinese food, there are almost always fortune cookies. He doesn’t like to eat them, so I get them all (Yey! Tasty!). 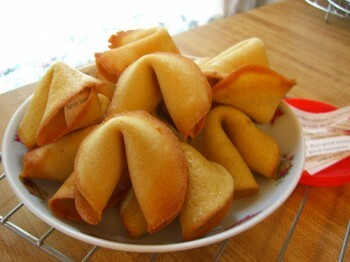 And as you all surely know, there are fortunes inside of fortune cookies. And not only is there a fun game where you add ‘… in bed!’ to the end of them, sometimes there are also hilarious typos. So I’ve decided to share all the fortunes I get with all of you, so you can either laugh A) when you add ‘… in bed!’ to the end, or B) at the typos. The SA didn’t agree with this one, strictly speaking. I maintain that I have plenty of charm and courtesy, probably. Friends long absent are coming back to you. This one was kind of true, as I met with a whole bunch of my high school friends. Of course, that was when I was visiting my parents in my hometown, so they weren’t actually coming back to me, since I had to go to them. And I also had to leave the area again, because, you know, I don’t live there anymore… and I opened the fortune after it happened. Your luck has been completely changes today. Been completely changes, eh? Well, maybe that’s a good thing. Stay tuned for more fortunes!